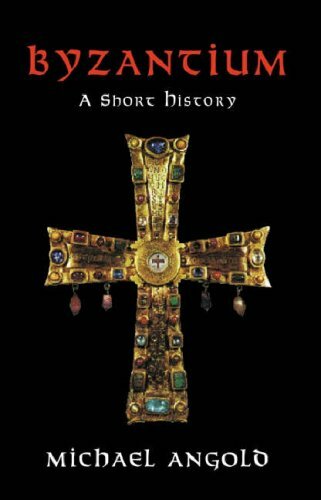 Angold's history of Byzantium focuses on the period between the establishment of Constantinople in the fourth century through the iconoclasm controversy, finishing up in the ninth and tenth centuries. It provides a brief overview of that period, focusing overwhelmingly on the various intrigues and machinations of the royalty and highest levels of the clergy. It's not clear to me why this short book stops midstream, instead of spending another 75 pages or so covering the events of the latter centuries of the empire -- all the more so, given the inclusion of a long and only tangentially-related appendix on the Norman conquest of Sicily. What is that appendix doing in this book? It makes one suspect the author had an article ready to go in his drawer and used it to pad the length. I felt, given its brevity, that the book's focus was often misplaced - especially in the case of the baffling amount of scrutiny given to the iconoclasm controversy. Significant though that episode may have been, I was increasingly incredulous as the account went on, finding that it occupied nearly half of the book. While this politically-significant but theologically-negligible incident receives close scrutiny, Angold devoted scarcely a word to the economy, trade, social organization, or way of life of the vast majority of the people of the empire, absorbed as he was by the drama of princes and kings. The highlight of the book for me was his excellent account of the divisions between Byzantium and western Europe during the reign of Charlemagne. Sign into Goodreads to see if any of your friends have read Byzantium.